With Spring right around the corner, now is a good time to learn about the importance of mouthguards for youth sports. Whether your son or daughter plays Lacrosse or some other sport, plan to buy a mouthguard when you buy your child’s sports equipment. You can choose from three different types of mouthguards. An important point to know is all types of mouthguards are effective. The differences between the mouthguards are cost, comfort, and how long they will last. If cost is an issue, consider a stock mouthguard. 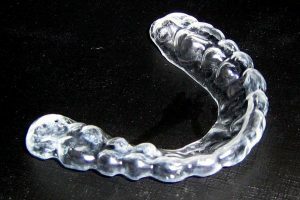 This type of mouthguard is ready-made and is available in small, medium, and large sizes. You can purchase a stock mouthguard from any store that sells sports equipment. The boil-and-bite mouthguard is more comfortable. The mouthguard is meant to be softened with hot water, and molds to fit your child’s teeth. The custom-made mouthguard is the most comfortable and durable. This type of mouthguard can be made right in our office. It is the best option if your child wears braces. If your child is a young teenager, this mouthguard can last for as long as he or she plays sports. With proper care, it will not have to be replaced. Your child should never play a sport without wearing a mouthguard. Not only can there be damage to unprotected teeth, not wearing a mouthguard can result in damage to your child’s gums and jaw. Sports injuries can be painful and upsetting to a child. While a minor injury can take the fun out of sports, serious injuries can require hospitalization or extensive dental work. If you do not want your son or daughter to have these experiences, protection from injury is as simple as wearing a mouthguard. If you are not sure which type of mouthguard is right for your child, discuss youth sports with your dentist. This small piece of equipment can keep your child healthy and safe on the playing field or on the basketball court. Your dentist can recommend a mouthguard that will work for your child and is affordable for you. Your child may never experience a sports injury when he is prepared and protected.